Cracow Airport is situated on the north west of the city and is also called Balice Airport. The airport road signs refer to Balice. Cracow airport is the best airport if flying to Cracow. 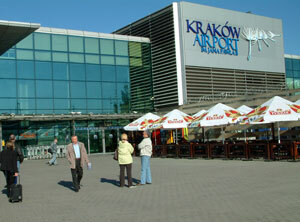 There is also an airport in Katowice which is an hour's drive along the motorway west. Europeans are able to drive to Cracow and indeed the city welcomes many German and Russian visitors. The quality of roads has much improved in recent years and matches that of may other countries. Traffic in the city has to contend with a network of trams that can be daunting for some. There are some tolls on the motorway between Cracow and Katowice. Trams are the main method of getting around Cracow. See the network and timetables of Cracow's tram system. Various bus companies and tour operators run coach trips to and from Cracow. These are either between Polish cities and towns or international trips to foreign destinations such as London, Budapest and many other European countries. The main bus station is next door to the main train station in Cracow which is useful for connections. There are various Polish websites that show bus timetables nationally and also sell tickets for international bus trips. Taxis stands are found outside all railway and bus stations stations in Cracow, also thr aitport. Ask for a price before you start your journey. Many taxi drivers will give you a fixed price, or alternatively ensure that the meter is switched on. Ask around at your holiday accommodation for the average fare you would expect to pay to get from the hotel to your destination. Hotels will always phone for a taxi for you.